Great writing, without a doubt. The lead characters are not my cup of tea. The Beauty and the Beast theme is alright. I am usually averse to a mother heroine. But the book still snatched 3 stars from me. That is no small feat. 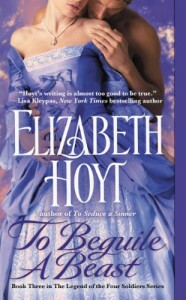 Only Elizabeth Hoyt can make me read a book featuring a mother heroine. Alistair the hero is the beast. I was little shocked that he lashed out at Helen when he realized that she was someone's mistress and had 2 children by him. His reaction was a bit hypocritical for me. I do however appreciate that he was not "super understanding" to a point of unbelievability. Sometimes the authors write heros so "noble" that I want to puke. I think repulse is a natural reaction for Alistaire, but to accuse or condemn Helen (which he did), that is unfair. I have to say that the four soldier series so far (I have read 3 out of 4) has been rather bland for me. I cannot say that I LOVE them but they are all great reads. It has everything to do with Elizabeth Hoyt. Her writing and way with words totally make the books worth your while. Unlike other reviewers I was not so impressed with the children. They were ok and much more tolerable than most children in romance novels. But I could have done without them. But that has a lot to do with my aversion to heroines who are mothers. I wasn't blown away reading this book but it is well written and fun to read. Really fantastic writing, there no is other word for it.